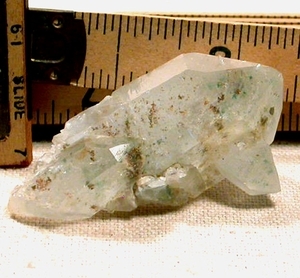 Vivid green, tan and chocolate chlorite inclusions freckle this doubly-terminated, elestial base Arkansas quantum quartz cluster. Imagine: healing AND the companion to help you ride the next wave of your life in a comfortable, power-packed portable size! Quite rare dogtooth host is Isis faced and self-healed, record keepered, and penetrated by several crystals [to 7/8"! ], one shallow small tip chip. Two members, one with a very rare stepped face, have phantoms. Numerous rainbows.